Select the Cloud Drive from the left side panel of the Discover Data page. Drag-drop files/folders from anywhere into the root of this Cloud Drive folder, or create a new folder there, and drag/drop the data into it. Delete selected data by selecting file(s)/folder(s) and clicking the Delete icon ( ). Share selected data by selecting file(s)/folder(s) and clicking the Share icon ( ). Download selected data by selecting file(s)/folder(s) and clicking the Download icon ( ). Refresh the page by clicking the Refresh icon ( ). Upload files to the Cloud Drive by clicking the Upload icon ( ) and selecting the wanted file. Create a new folder inside the Cloud Drive main folder by clicking the New Folder icon ( ). View the deleted files by clicking the Show Deleted Items icon ( ). Select the Vault option from the left side panel. 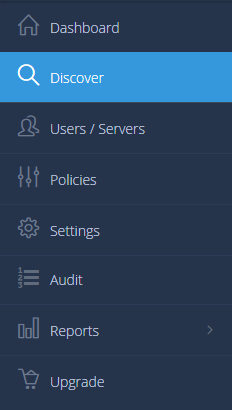 If you do not have Vault added to your account yet, you’ll need to add/enable it to proceed. Drag-drop files/folders from anywhere into the root of this Vault folder, or create a new folder there, and drag-drop the data into it.